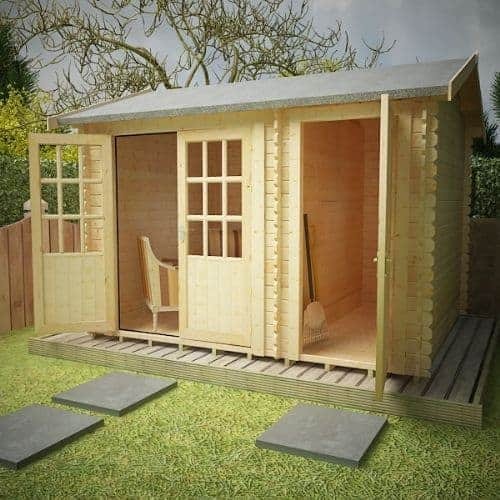 The following review is for The Capetus range of 44mm log cabins by TigerSheds. Although we were not actually able to view this specific model when we recently visited TigerSheds’s showroom, we did spend considerable time inspecting an example from The Shere, The Rho, and The Procas ranges. Each of these models offer slightly different design choices. However, the basic construction methods are the same across the range, allowing us to get a great feel of The Capetus, without actually seeing it. 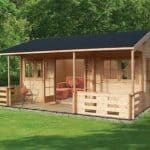 First impressions of The Capetus are that the structure provides the ideal space for those wanting a multifunctional log cabin. The inside is partitioned allowing one room of the building to be put to one use (e.g. relaxing) and the second for a different one (e.g. storage). Unlike most of the 44mm range, this cabin actually features both a spacious double-door arrangement as well as a single one. This allows access to either room from the outside – a great touch. The same commitment to quality that can be observed across the entire 44mm range is on full display in The Capetus. This is immediately obvious from the structure’s beautiful finish and the manufacturer’s obvious attention to detail. Anyway, we’ve loads to get through in this review so let’s get cracking and find out just what makes The Capetus special. 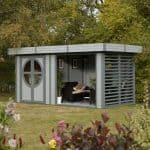 Multifunctional space – you don’t need to decide whether you want a chill-out zone, or a tool shed, The Capetus can is both! Fantastic quality and finish. It’s obvious that TigerSheds employs some skilled artisans to craft their cabins. The attention to detail is phenomenal. Free height reduction if regulations stipulate it necessary. Cabin requires treatment – not included in the price. TigerSheds’s sales module can be somewhat misleading. According the company’s online sales module, The Capetus is available in just one size – 12’x8’ (3550x2350mm). 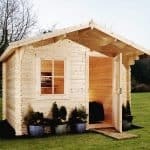 However, as with all TigerSheds’s 44mm cabin range, custom sizes are available. Customers are advised to contact the firm directly to discuss different dimensions. The Capetus features a stylish reverse apex roof, providing ample roof space to appease taller dwellers or create additional storage space. This does, however, mean that the structure stands at 2623mm at its highest point. It therefore may fall foul of certain local regulations in its default sizing. Some planning offices state that where a cabin is less than 2m away from a home, it must also be below 2.5m tall. For those living in these areas, TigerSheds offers to reduce the height of their 44mm cabins free of charge. Not all the firm’s competitors will provide this service and when they do, it will often cost more. Such an ability to accommodate the needs of customers is certainly one of the standout features of the TigerSheds package. The Capetus log cabin uses slow-growing European softwood throughout. 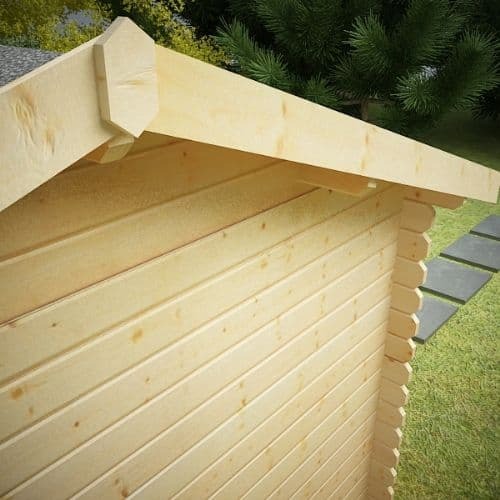 However, such a name is misleading since this choice of material is actually far superior to the Baltic white wood used by some cabin manufacturers as a cost-saving measure. The redwood variety used by TigerSheds is far less prone to warping or splitting and has a naturally smoother finish than inferior materials. One of the things that really impressed us with TigerSheds was the fact that the company owns its own mill in Yorkshire. This means that it imports none of the wood used in the construction of The Capetus. Each piece is cut to order where, by contrast, competitors’ products may have been sat in warehouses or at a dockside waiting to be shipped. This can result in damage to the materials before the cabin is even built! In terms of treatment, the 44mm range of log cabins is provided without one. However, the manufacturer does recommend that all garden buildings be coated in a spirit-based treatment as soon as possible following construction. Although treatments must be bought separately, the company does carry two products in a range of colours. Firstly, there is the more natural TigerCare Protections range. These treatments come in five litre containers in clear, as well as three natural colours – Red Cedar, Mahogany, Dark Oak. However, if customers want to make their cabin really standout, we recommend opting for the slightly pricier Cuprinol Garden Shades range, also carried by TigerSheds. This product line is available in Seagrass, Pale Jasmine, Forget-me-not, Summer Damson, Olde English Oak, or Black Ash. The walls of the 44mm range of cabins are exceptionally hardwearing and The Capetus is no exception. The 44mm logs are all four-way chamfered and interlock using a double tongue and groove joining system. We have seen other competitors offer their flagship models with thinner walls. 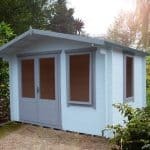 Although this might save a few pounds in the short-term, the benefits of TigerSheds’s superior construction methods will really make themselves known years down the line. The other cabins from the range we saw in Leeds really inspired us with confidence and we have no doubt that The Capetus will offer just as high levels of security, heat-retention, and protection from the elements. The roof to The Capetus is constructed using 44x120mm rebated purlins. 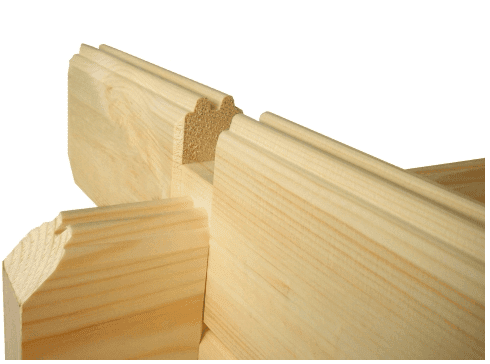 This robust frame supports 19mm planed tongue and groove roof boards. The roof is finished with heavy-duty green mineral felt as standard. Although certainly hardwearing enough for even the bleakest winters, additional insulation and style can be added to The Capetus using the optional upgrade to shingles. These come in four colours – green, black, red, and brown. They’re also self-adhesive and simply nail onto the roof boards. We liked how TigerSheds go the extra mile to simplify the methods used to erect and modify cabins. This makes them easy to construct, even for those less experienced with DIY. For those wanting to further customise their new garden building, guttering can be added to the structure at a cost. Again, this has been designed to be as easy as possible to install. The gutters themselves are pre-attached to wooden boards that are nailed to both the underside at the front and back of the reverse apex roof. One of the most important but often overlooked aspects of a log cabin is its floor. We have seen manufacturers include a floor that is not really fit for purpose for the entry-level price. This can often be upgraded to something more like that offered by TigerSheds’s 44mm range – at a cost. In fact, we’ve even seen some not offer any floor at all for the listed price – kind of like selling a car without wheels and then charging for the inclusion of this vital component! 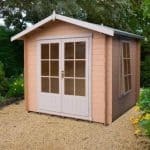 We were refreshed to see that TigerSheds has not tried to cut corners or lure customers with a price that doesn’t include adequate materials from the off. The floor in The Capetus is constructed using heavy-duty, 19mm, planed boards which are joined in a tongue and groove system. These are supported by 44x57mm tanalised bearers. This pre-treated frame will provide excellent resistance to damp from beneath, which is often the cause of most cabin’s ultimate demise. This combination of superior building methods makes the range standout from the cabins offered by TigerSheds’s peers. Each of the models we saw in Leeds feature this robust flooring and we were impressed by just how little give there was in each. Although the entry-level offering is great for most cabin owners, those wishing to use The Capetus as a workshop are advised to consider the upgrades to thicker flooring. These can transform the building from a comfy living area into a robust industrial space, for an additional price. This is the part of the review that we would normally turn our attention to both the windows and the doors of The Capetus. However, thanks to its partitioned design, windows have been omitted from the model. This can make the cabin feel a little gloomy inside. However, an upgrade to full pane doors or even contacting TigerSheds to customise the design with a side window should rectify this minor quibble. It might lack windows but The Capetus does feature two doors – a double one for the main area and a single, full panel for the storage partition. These doors have been beautifully crafted by TigerSheds’s inhouse joinery team. Small touches like the tasteful architrave found on all doors clearly demonstrate the firm’s commitment to a quality garden building. Euro style – modern and elegant, with large panes to let in ample light. Full pane – contemporary design that comes with toughened glass as standard. These let loads of light in. PVC – the ultimate in security and insulation. They feature double glazing as standard. Fully boarded – a workshop style door with no glazing. In terms of the glass itself, TigerSheds offer 3mm glazing as standard. Whilst this is certainly insulative enough to use the cabin during the summer months, those wishing to stay toasty into the winter should considered upgrading to either the 4mm toughened glass option or double glazing (two 4mm panes with a 6mm airgap). Although there are certainly security and comfort benefits to be gained from either of these upgrades, we found the entry-level 3mm glass included with The Capetus demonstrated how keen TigerSheds is to provide a quality building without adding extras. Even this basic option is fully draft sealed, as well as beaded both internally and externally. We have seen other manufacturers using cheap plastic to glaze their entry-level cabins or a much thinner glass than that offered as standard on The Capetus. We were pleased that TigerSheds has not tried to take any of these cost saving measures. The doors themselves are rebated into the frame – just as you’d see in house construction – and the hinges used are recessed. This means that they can’t be ripped off using a crowbar by some undesirable hoping to make off with the cabin’s contents. The hinges themselves are also a much higher quality than those pin hinges commonly used by competitors to increase profit margins on products. Whilst on the subject of doors, we might as mention the cabin’s security features. Each of the doors to The Capetus is fitted with a high-quality mortice lock. Being as secure as most house front doors, this once again highlights the firm’s commitment to providing the highest quality as standard. Some competitors might offer an inferior cylinder-style lock. Again, these might save a few quid in construction (that may or may not be passed on to the customer), but the price of the additional peace-of-mind provided by the sturdy mortice lock provided by TigerSheds surely exceeds the upfront difference. As with the rest of the 44mm range, The Capetus can have flower beds, planters, and decking added for a fee. Decking features the same robust construction as the cabin’s floor. It can really add a serious “wow factor” to your cabin. 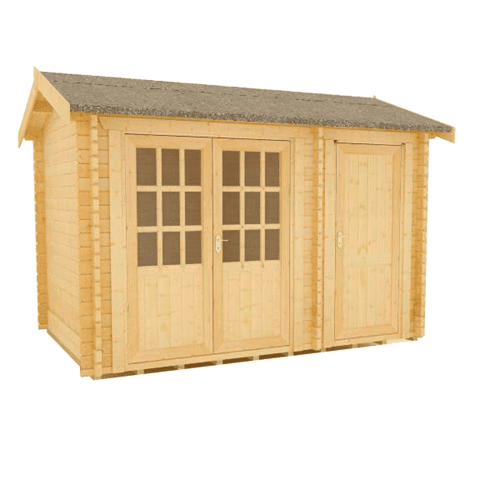 We loved that TigerSheds offers a professional delivery service as part of the listed price. Whereas some manufacturers will elect to deliver cabin pieces by hand, inviting opportunities to damage components, TigerSheds will drop The Capetus off using its own 18-ton HIAB truck with built-in crane. Not only are components considerably less likely to be damaged in transit or delivery using this method, if they are, it is TigerSheds who will be solely responsible, and customers will not need to complain to a third-party delivery firm. 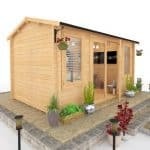 To make receiving their new cabin as easy as possible, TigerSheds will arrange a delivery time that suits the customer. They can select from a range of two-hour time slots. Delivery isn’t offered as standard for every log cabin manufacturer and when it is, it is often outsourced, or done by hand. This is yet another area that TigerSheds stands out for its quality all-round service. Whilst not exactly cheap, professional installation of The Capetus can be included. TigerSheds have gone to great lengths to ensure that their cabins are as easy as possible to construct but it simply isn’t possible for all customers. Many lead busy lives or may suffer some sort of mobility issue. For these, the professional installation service is certainly a blessing. It’s also great for those who would rather the manufacturer take responsibility for everything! To conclude, The Capetus is a stunning and practical garden building for those wanting the ultimate in relaxation or work space, along with plenty of room to store the barbecue, garden tools, pushbikes, or whatever really. It’s essentially both a shed and a cabin rolled into one. We loved the superior construction methods opted for throughout the build by TigerSheds and felt that the level of care and attention that has obviously gone into the cabin will equip it well to provide joy to its owners for many years to come. Not only is The Capetus stunningly crafted, however, it can also be customised to a huge degree. This allows customers to really put their own stamp on their garden building and a fully customised Capetus will look quite different to those featuring the entry-level design choices. We did have a few quibbles with The Capetus though. We thought the design could benefit from a window and possibly a door connecting both partitions would make the space even more functional. However, given TigerSheds’s commitment to customer satisfaction, we feel that the firm will be more than happy to accommodate such adjustments to the base design. This is high quality all the way through. As long as you treat the cabin on an annual basis and do not abuse it then we feel that you could actually get a life time of use from this building. Without forcing you to make bad compromises but giving you just the right amount of options to customise. This is a two person job, but as long as you can both tell the difference between a hammer and a screwdriver, you will be fine. This is one of the best value log cabins we have seen. Final Thoughts: Final Thoughts: We love the smooth design and are sure you will too when it is standing with pride in your garden. 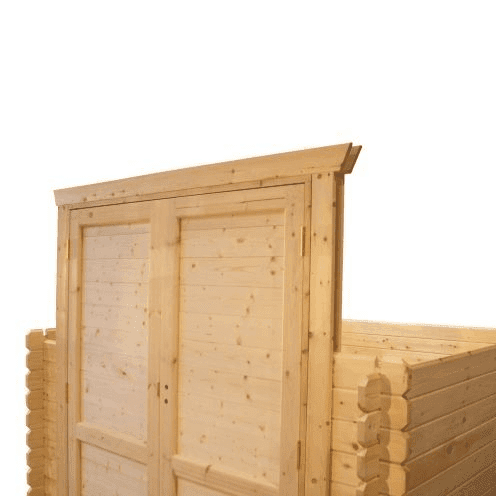 The quality of materials they have used all the way through the building along with the frame makes for one very solid and long lasting log cabin. If you want a log cabin that looks good and is very strong, then you will struggle to beat this one.